This is pretty loose, since it’s not a cookbook recipe, and I didn’t take very good notes (sadness!). But, nevertheless, you’ll get something to work from! Preheat your oven. I set our toaster oven to 350 F on convection. Cooler would probably be fine, but will take longer. The linked article suggests 275 F.
I started by covering our toaster oven’s baking pan (it came with it) in a layer of pumpkin seeds. This probably is a good cup in ours, but yours will probably differ. Sploosh some of your fat (olive oil, vegetable oil, and/or butter) on them, and mix up until everything looks coated. I’d guess that this is 2-4 T of whatever you’re using. Then, coat with whatever seasoning you are using. This is a heavier coating than a sprinkle. Maybe a tablespoon? 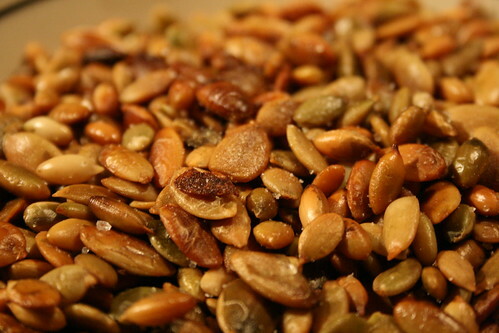 Toss the seeds in the seasoning until it looks distributed well. Then, in the oven! I checked on the seeds every 5 minutes and stirred until they looked good. Look for browning, but not burning. Our seeds spent 20-30 minutes in the oven, not including the time I was stirring (set timer for 5 minutes, take them out and stir when it beeps, start again when they’re back in). If you hear a couple of pops, that probably means they’re getting done. Olive oil and salt. Simple, but tasty! You want to use good olive oil for this, since it’s the primary flavor. Cinnamon and brown sugar. I used a combination of melted butter and vegetable oil for this. You’ll have to be careful to keep the brown sugar from burning. Spicy! Vegetable oil and a touch of sesame oil as the fat; soy sauce, red chile powder, whatever other spicy stuff you have around.